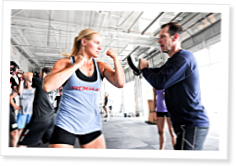 CrossFit Striking combines punches and kicks with traditional CrossFit movements to introduce new elements into training. I closed my eyes and spun in a circle, around and around, until I felt a tap on my shoulder. I opened my eyes and dizzily threw three unsteady knee strikes into a focus pad. Before I could finish the third one, I felt another tap on my shoulder. Each time I finished one set of three strikes, I’d feel a tap on my shoulder, hear a shouted command and throw another three strikes while the people surrounding me yelled and hooted, making the whole experience more confusing. Then George Ryan, the CrossFit Striking Trainer Course leader, yelled, “Stop!” and it was over. The whole thing lasted about 20 seconds. I was left panting and disoriented. Hilary Achauer, a well written and thorough article describing the CrossFit Striking Course. Great job. I enjoyed the story about Leandra Bevans, who also attended The Striking Cert., and the progress she has made with her training.